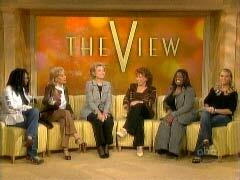 Hillary Clinton arrived for another soft-soap interview with the women of The View on ABC Monday, delighting the cast with a pledge that if she's elected, "the era of cowboy diplomacy is over." She told Elisabeth Hasselbeck her policy on interrogations is "We do not condone or conduct torture....Because that gives us a lot of moral authority, which we have lost, unfortunately." The cast was also touched by her standard campaign boilerplate that women in their 90s want to see her be president, and parents point to her and tell their daughters that they can be anything. WHOOPI GOLDBERG: So what are the first three things for you that you see most important? JOY BEHAR: Cowboy diplomacy is funny. BEHAR: It's an oxymoron, actually. CLINTON: But it's what we've lived with. CLINTON: Absolutely, so could a lot of people, I want Republicans and Democrats. HASSELBECK: When we come back, I have a question just on safety, because I think a lot of Americans. WALTERS: We have so many questions. But we also want to ask what everybody 's talking about now, and which is a little confusing, is Iran. So, you know, we'll get to all of that. We'll come back with Senator Hillary Clinton. HASSELBECK: We mentioned security on "The View." You know, I think it's on a lot of people's minds in terms of national security and in terms of how, if you were the president, how you'd handle, you know if there was an imminent threat. Would you use extreme forces to get information? What's your theory now? Because I know, obviously, I know times change and opinions change. CLINTON: You know, Elisabeth, I think it is really important for the United States to make it absolutely clear that as a matter of policy we do not condone or conduct torture. I think that has to be our value. Because that gives us a lot of moral authority, which we have lost, unfortunately. We also have to be smarter about how we interrogate. There's a lot of evidence that you don't get accurate, good information from extreme measures. In fact, you get it by developing some kind of system that can really, you know, get people to feel that they need to give you that information. That's what we did during World War II, that's what we have done in previous times. So, I think for both the moral and values reason and because of the lack of effectiveness that a lot of these so-called techniques have, we need to be very clear that we do not conduct torture. WALTERS: You know, we were talking about some of the things that are different when you're a woman. And, even though you are running with men and, you know, if you win, you'll be the first woman president, there must be differences in the way you run as a woman and the way the men do. CLINTON: I think there are. CLINTON: Well, look how much longer it takes me to get ready. WALTERS: I'll give you that. BEHAR: But it's worth it, look how good you look. WALTERS: Remember how they always asked about your hair? CLINTON: Oh yes. The hair, the clothes, the laugh. WALTERS: Do you mind that? CLINTON: No. I really don't. WALTERS: This is when you should laugh. CLINTON: My attitude is that you just get up every day and do the best you can. And some days are better than other days. WALTERS: Are there other differences? CLINTON: Well, I do think that there still is, you know, probably a tougher standard for women, especially running for president. I mean, we've all been through it in some way or another where you go and try to break a barrier, you try to do the best you can, and people are saying, well, I don't like her clothes or I don't like her hair or whatever. But I think that we're getting beyond that. And one of the exciting parts of my campaign is how many people are so personally invested in this. You know, everywhere I go around the country, there are two groups of people that I'm particularly touched by. All these women in their 90's come to my events and they come and they wait, sometimes they're in walkers, sometimes they're in wheelchairs, like a daughter or granddaughter will bring them. And then when I'm going around shaking hands, they'll say something like I'm 95 years old and I was born before women vote and I want to live long enough to see a woman in the White House. CLINTON: It is, it's very touching. And then the other group are parents who bring their children, particularly their daughters. And so after I make a speech and I go out and shake hands with everybody, I'll hear a father or mother lean over and say to a little girl, see honey, you can be anything you want to be. And I get that sort of welled-up feeling because my parents told me that. Not that it was really true back then. But you know, we've broken a lot of barriers to get to where we all are today. BEHAR: When you're on the road like that, What about the white males? How do they respond to you? CLINTON: You know it's been wonderful. I have lots of people who come and they are very interested, they ask tough questions, but, you know, they come in greater and greater numbers now. And I've been very excited about that." WALTERS: What about the criticism which we hear all the time, and we were talking about Michelle Obama, and we have to ask you if it's tougher to answer back the wife. But you're polarizing, you're polarizing, you know, yeah she'll get the nomination, but she's not going to win the election, she's polarizing. CLINTON: Well, you know my attitude is that's what a campaign is for, to get people a chance to see you for who you are and make their own judgments. You're never going to have a hundred percent of the people to support you. WALTERS: Do you think you're polarizing? CLINTON: I think that I have strong feelings about what should be done in the country and I think a lot of people disagree with that and I respect that. That's the way America is. You can be for or against anybody based on anything. But I just want people to make an accurate decision about who I am and what I stand for and what I would do as president. And that's happening. So, I'm very happy about that. CLINTON: I have been to 82 countries and I have met with the leaders of a lot of countries that are not exactly in the forefront of giving women their rights, and I've never found that to be a problem. I actually think, assuming I'm so fortunate as to be elected, that sends a very strong message to those countries and to those leaders. You cannot expect to have a successful society if you keep half your population in servitude and deny them their rights and keep them out of education and health care and important positions and don't give them the respect, even in the home, that they deserve for the hard work that they do. So I actually believe that it may take a little adjustment, but it's time the world adjusted. Women deserve to be given rights and responsibilities.